Added by jizardy over 8 years ago. Updated over 2 years ago. 2.get to the "bathroom galaxy" and play the sphere level. Dolphin version with the problem? 32-bit or 64-bit and any other build parameters? i think that the reflection deformation was set to high value and it flips the image and glitch it..
it also looks like the reflection is inside the ball (not over it)and behind the star. Does r6126 work well? If so, I will revert r6127. i think this is a older issue and more related to the graphic plugin.. do you think so? i can test on older builds if you want me to..
i did test on rev.6094 problem is there too i think this issue is present since the frist time SMG1 was emulated. jizardy: Thank you for the testing. I think the problem does not relate to my commit. I'm sorry but I will release this issue. Please test if r6478 has fixed this issue. i test on DX9 plugin issue still there. Have you got a save game that we can use to reproduce the issue? do you refer to the save data that are on "user/GC folder"? if that so then yes. or i can make a save state. im uploading my memory card and a save state to skydrive. i will post links to it in a little bit. 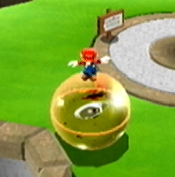 To export Wii save games, right click on Super Mario Galaxy in the game list and select "Open Wii save folder". Then zip up the folder that appears including sub-directories. are those the files you requesting for? Yes, upload both files and the folder please. is called Zip/Rar file called "data"
Sorry for misspell im just getting home from work is 3am :P so im goin to bed. Did you got the data? This issue is still occurring. Looks like the flip bits for X and Y reflections isn't being emulated. I have attached a savegame for the USA version of SMG. To reproduce it, unzip the save game to the User\Wii\title\00010000\524d4745 folder and follow these steps (takes 2 minutes to reproduce). im back on testing if i can help out on something just let me know. 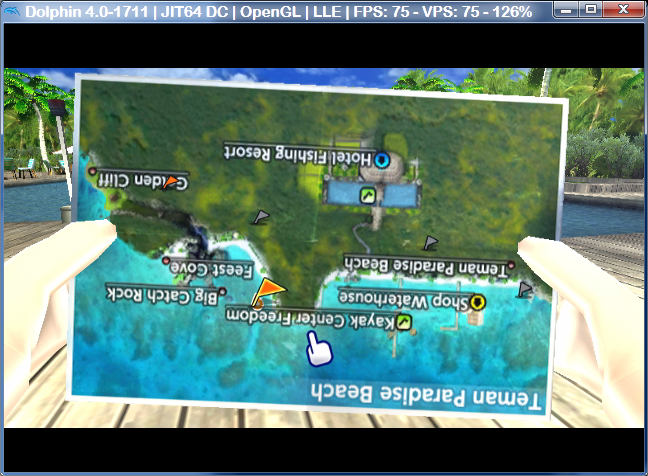 Another game with this problem is Fishing Resort Wii (NTSC-U) at the maps screen. The maps are shown upside down and right to left. This baby issue have more than a year and a half and it starting to walk by itself!! is really bad that Fishing resort is having same problem. well i think flip bits for X and Y reflections are being emulated because is present, maybe just the size of it is wrong or graphic reflections on wii uses some sort of programing/compression trick on reflected images to free work loads on the limited wii hardware and that maybe is not being emulated. Will leave this open to track the Fishing Resort Wii maps problem. This issue also occurs with the software renderer. Did not spot any bugs that might cause this issue in the GPU emulation. Suspect that it is some sort of CPU issue - maybe a sign issue or FPU issue. The Fishing Resort issue is still around as of 4.0-1711. The maps issue is still occurring as of 4.0-3669. Confirmed in 4.0-8342 in D3D and OGL, in case anyone has issues with save file I have one here https://mega.nz/#!cVVhzCoa just load and hit q to feel like the most hopeless recreational fisher in the resort. Testing done with 1X IR. The Wiimote strap screen is inverted on Jimmie Johnson's Anything with an engine game. Could we please not tack more potentially related bugs onto the same issue report?